I am so glad I am participating in the Novels in Verse Challenge because it has introduced me to authors like Sonya Sones. What My Mother Doesn’t Know gives an awesome insight into the mind of a typical high school freshman. The novel follows Sophia through her romantic travails, her first being with Dylan, one of the cutest boys in school. From the first time they lock eyes until their final tears, the reader rides all of Sophia’s emotional waves. Sones is particularly adept in describing the feeling when you realize you don’t like someone romantically anymore, and the awkwardness that it brings. Sophia’s relationships felt realistic and similar to the ones my students will have. A highlight is Sophia’s relationship with her best friends, Grace and Rachel. While neither of those characters is well-developed, their friendship is loving and fun. The girls provide a foundation for Sophia that is more supportive than the one she receives from her quarreling parents. They feel true to silly, wonderful adolescent friendships, whether they are popping each other’s pimples or treating a newly single friend to a movie. I was surprised to learn that What My Mother Doesn’t Know was one of the most frequently challenged books of 2004 and 2005, due to a poem where Sophia describes her body’s reaction to the cold. While the book skews mature for my current class of sixth graders, I think there is so much to gain from adolescents reading this book. 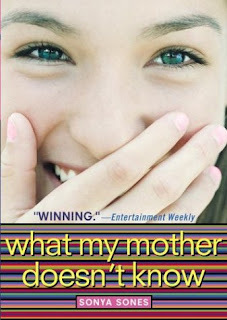 I also highly recommend it to mothers, who will benefit from seeing life through a teen’s eyes. If you haven't signed up for the Novels in Verse Challenge yet, I recommend you do so. The lowest level only requires one book (in a year! ), so reading What My Mother Doesn't Know could satisfy it for you. Do it!